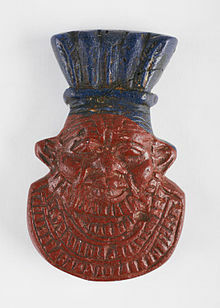 Bes was the ancient Egyptian god of protection of pregnant women, newborn babies and the family. He was a dwarf wearing a lion's skin. Bes does not look like he is Egyptian. He is like gods found in other parts of Africa. To scare away demons during birth, Bes would dance around the room, shaking his rattle and yelling to scare away demons that might put a curse on the child. After the child was born, Bes would stay by him/her. When a baby laughed or smiled for no reason, Egyptians believed that Bes was somewhere in the room making funny faces. His name appears to be connected to a Nubian word for cat, besa, which literally means protector. Egyptians kept cats in order to attack snakes, and creatures that might ruin crop stores, such as mice, and so Bes was naturally singled out as worthy of worship in Egypt. Images of the god were kept in homes to protect from evil and so he was shown quite differently from the other gods. Normally gods were shown in profile, but instead Bes appeared in portrait, and sometimes in a soldier's tunic, so as to appear ready to launch an attack on any approaching evil. In the New Kingdom, tattoos of Bes could be found on the thighs of dancers, musicians and servant girls. Like many Egyptian gods, the worship of Bes was exported overseas, and he was popular with the Phoenicians and the (ancient) Cypriots. Bes, the family god, protected children from the dangers of snakes and scorpions. Like the hippopotamus god Taweret, Bes was the protector of women in childbirth. The Egyptians put a statue in their room or a carving over their bed to protect them from bad dreams. He brought good luck and good health to all that honored him. This household deity was also the god of music, dance and pleasure. Bes was shown in full-face, unlike the other gods who were drawn in profile. This bandy-legged, large bellied dwarf wore an animal pelt and feathered headdress. He brandished a weapon or played a musical instrument while hopping about. Bes’ tail and lion’s mane stood out from his dwarfish features. With his tongue sticking out or teeth bared, this god had a place in every home. Bes started out as multiple demons, which morphed to form a rearing lion as his first combined form. His power increased from the Old Kingdom to the New Kingdom. He started out as the protector of the pharaoh but shifted to being worshiped by civilians. In the New Kingdom, the female form, Beset developed from Bes. Items with his depiction were common in a very broad field, which included Sub-Sahara Africa, modern Turkey, Cyprus, Syria and Assyria. This implies that Bes was highly popular in the Middle East. The fact that Bes was depicted full-face suggests he originated from Africa. Wikimedia Commons has media related to Bes.